More than ever, Americans are looking for a way to minimize their impact on the environment. Many of us buy local and organic when possible. We recycle. We bring our own bags to the grocery store (when we can remember). We drive efficient, hybrid or even electric vehicles. In general, we want to do what is right, as long as it isn’t too complicated or inconvenient. Until now, composting was just that... complicated and inconvenient. And it smelled really, really bad. Many families want to compost their food waste; they just don’t want the deal with a messy, smelly, fly ridden nuisance. "I tried composting," Molly, an Austin-based web designer explains, "Bought this little bin for the kitchen and dug a hole in the yard. That lasted maybe two weeks. It was just way too complicated and kind of gross. I don’t want to be wasteful, but I just don’t have enough time in the day to maintain a compost pile." According to the Environmental Protection Agency (EPA), the average American generates approximately 4.4 lbs of waste a day. That adds up to 1,600 lbs of household garbage in a year and that's just per person. A household of 4 produces a staggering 6,400 lbs of waste. Much of that garbage is simple food waste. If you, like Molly, want to reduce your environmental impact, food composting is the way to go. And now with the Bokashi Food Waste Recycling System, kitchen composting is easier and more pleasant than ever. Standard composting relies on the rotting process, requires 140 and 160F degrees to activate, takes weeks to complete and demands a significant amount of churning. It’s not just inconvenient, it’s downright labor intensive. Add in that compost piles produce smelly gasses (methane, carbon dioxide and ammonia) and deplete many nutrients (carbon and nitrogen to name a few), and you can see why most American households steer clear of the whole composting process. The Bokashi System is different from traditional composting. While regular composting is a rotten heap, The Bokashi Food Waste Recycling System uses the fermentation process to quickly break down food matter into nutrient rich organic plant food. In contrast to traditional composting, the fermentation process utilizes live microbes, enzymes, traces minerals and vitamins to break down food and does not produce rancid smells or attract flies. Simply put, the process is quicker, easier and more pleasant than tradition composting. 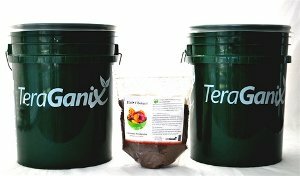 The Bokashi Food Waste Recycling System includes two five gallon buckets (keep one available for filling, while the other is maturing), two flexible translucent lids that make it easy to keep an eye on the progress, and one five pound bag of EM Bokashi organic rice bran, the fermenting agent. The process is easy and the complete kit only costs $36.99. Want to know more? Visit www.TeraGanix.com to learn more about Bokashi and other great EM Technology products.